The Victorian period of history had a few customs that today are considered, in most western cultures, to be downright creepy. One of those practices had to do with remembering their dead through post-mortem photography, also known as memento mori or memorial portraiture. Photograph © Burns Archive, used with permission. after 3-4 hours, and by 12 hours the body is officially a “stiff” though if it took the photographer longer than a day to arrive, the muscles had already begun to break down and soften, making the body more pliable for poses, but also more tricky to pose in a natural way; strings were used to keep hands or arms in more lively positions, or someone held the body either in-shot or hidden behind a drape near the chair. For a 3-minute video on this topic, click here. It is probable that both the mother and the child are deceased (her hands are in an unnatural pose). There has been a lot of discussion in the comments about the photo below; in doing the research for this article, I came across it in the context of post-mortem photography on several sites. No matter how much I try to get it right, sometimes things do slip through; it’s one of the woes of cyberspace leisure piracy, a bit like buying a cheap knock-off watch in Asia – you might just get what you pay for, even though you’re trying to buy the real thing. I try to give proper credit where I can locate original source material for images (and most of my articles have external links or state the source for the sake of information veracity), and so I gladly give the Burns Archive credit for two of their images used in this article. The photo below is, in fact, not post-mortem. The photo can be found in the Burns Archive’s Disease and Pathology collection, and their creative and operations director, Elizabeth Burns, has been kind enough to correspond with me on the matter. This woman’s story is worth telling, because it’s a thread in the tapestry of humanity, but unfortunately, not that much is known about her expect for the medical diagnosis: She was a sufferer of Lupus with Corneal Leukoma. The photo was taken by Alexandre Lacassagne, MD., circa 1895. 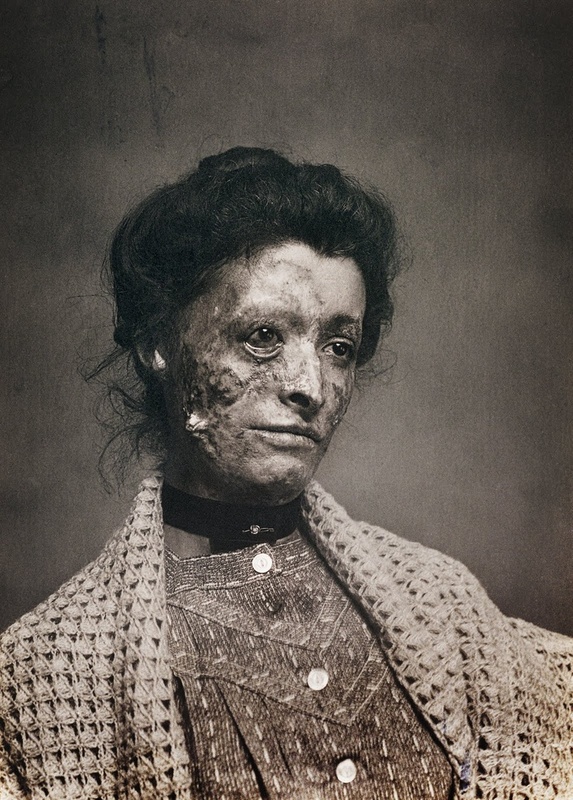 It is included in their 4-volume publication Photographic History of Dermatology. The image remains in this article as reference, because many of the comments below are related to it specifically. Based on the updated information however, it is not related to the topic of post-mortem photography, nor should her photo be used in that context by anyone using this blog as a source. Photograph © Burns Archive , used with permission. For a further look at Victorian Photography, click here. Posted in History, Victorian Period and tagged photographer, portraits of the dead, Post-mortem, Post-mortem photography, Victorian customs. Bookmark the permalink.